My attempt recently to inform the readers of the journal Tissue Engineering Part A about grave omissions and factual inconsistencies in the Steinke et al 2015 publication by Heike and Thorsten Walles failed spectacularly. Not because the concerns I raised about their tracheal transplants where deemed is irrelevant, far from it. It was the messenger who was seen as disreputable. The editor chose to send my letter out for peer review, despite the fact that I was never addressing the science of the paper, but the omitted, yet verified medical complications and deaths of the patients, as well as non-existent animal tests. Two of three peer reviewers simply chose not to believe me and my evidence, one of the reasons was: my blog site where I published it is not peer reviewed. I was also decreed to be scientifically incompetent, driven by personal vendetta against poor Walles (who are presently suing me at court for reporting about these transplants) and simply as a liar, who made all these things up. At the same time, the notorious third reviewer warns the editor that the journal’s readers must never see or hear of my accusations. Scientists often approach journal editors with their concerns about the scientific validity of a publication. Very occasionally, their letters to editor get published and open a scientific discussion. In most cases however, the concerned researchers are politely asked to get lost, with the argument that their criticism does not bring any sufficient novelty to the topic which is already well presented in the paper they wish to criticise. This was what happened to the thorax surgeon Pierre Delaere who repeatedly tried to raise the issue of Paolo Macchiarini’s misconduct and patient abuse with the journal The Lancet (read more about this journal here, and Delaere’s Open Letter on my site). He first sent his comment to The Lancet to criticise Macchiarini’s paper on his first cadaveric trachea transplant in Barcelona (Macchiarini et al. 2008), that comment was published (Delaere and Hermans, 2009). Delaere’s follow-up comment to The Lancet, reporting suspected misconduct by Macchiarini, was rejected by the executive editor David McNamee on May 20th 2010. When Macchiarini published his first plastic trachea transplant in The Lancet, which predictably proved a disaster and eventually killed the patient (Jungebluth et al. 2011), Delaere wrote to the journal yet again. That comment was also rejected. In 2012 the Belgian surgeon made another attempt and was told by the senior executive editor Sabine Kleinert to stop accusing Macchiarini of scientific misconduct. Delaere’s next letter to The Lancet was rejected on February 3rd 2014 by the senior executive editor Spencer Stuart who did “not see that repeating these concerns is a priority for the pages of The Lancet”. When the Macchiarini scandal exploded in 2015, Delaere tried again to raise any basic human decency and responsibility for patient safety with that journal and its Editor-in-Chief, Richard Horton. Delaere’s emails were all simply ignored by then. So I am in a good and very honourable company here, with my own little rejection. The journal Tissue Engineering Part A on the other hand already showed their peculiar attitude to research integrity before. This they did in the wake of the STAP scandal, where two Nature publications claiming creation of totipotent stem cells by acidic treatment or squeezing, were retracted in shame for blatant fraud (see my earlier reporting elsewhere, e.g. here or here). The two main authors, Haruko Obokata and the Harvard medicine professor Charles Vacanti were however invited to correct a heavily manipulated STAP-related paper in Tissue Engineering Part A (Obokata et al 2011, evidence of manipulation here and here). That correction is in fact well hidden: it is not linked to the original article by the journal and costs you $59 to read, but not for longer than 24h. One wonders why this journal is so tolerant to trachea transplanters: Vacanti actually attempted in 2010 to transplant a 14-year old patient with a “stem-cell-regenerated” plastic trachea, a year before Macchiarini did same. Luckily, Vacanti is not a surgeon, but an anaesthesiologist, thus not in charge of the operation. The young woman’s life was saved by a surgeon colleague who saw no regenerated tissue growing on the plastic tube and aborted the transplant. Vacanti and his plastic trachea were celebrated as life-saving nevertheless, by his Brigham &Women’s Hospital in Harvard (read the story here). And indeed, they both were, since Vacanti’s deadly graft was luckily never implanted. “The editors have suggested that you present your claims in a letter to the editor. If ultimately accepted for publication, it would be published, probably with a response from the authors of the manuscript. If you choose to submit your letter yourself, please let me know first, so that I can arrange to have the submission fee waived”. The email was signed by Kay McGarrity Desmond, editorial assistant for Tissue Engineering Part A. I only communicated with her, the two Editors-in-Chief, Antonios G. Mikos, and Peter C. Johnson, never ever replied to any of my emails addressed to them. Below is my invited letter to the editors of Tissue Engineering Part A, and further below the editorial rejection together with peer reviews. The described patient was according to all available evidence operated with a tracheal transplant in 2009 and committed suicide 2.5 years later, in 2011. This death is acknowledged by Profs Walles in their own court testimony, cross-linked here (3). The 2015 publication (1) makes no mention of this patient’s death, and presents a 2.5 year follow up. The answers to my inquiries if this was in fact possibly an autopsy and not a biopsy were denied by the responsible research institutions and the hospital Schillerhöhe in Stuttgart. The patient had his tracheostomy re-opened shortly after the operation, which goes entirely unmentioned in the 2015 paper. The existence of this re-opened tracheostomy until the patient’s suicide death in late 2011 is confirmed in the 2013 book by Bernhard Albrecht (4) as well as by Thorsten Walles’ own court testimony (3). The publication mentions no previous animal testing of such tracheal transplants. The provided reference concerns instead a human test where a patient had a tracheal graft implanted into his arm for 1 week (5). This patient received right afterwards a tracheal graft into his airways, he died „a few weeks“ after the surgery (6). This operation and its outcome however were never published, according to available peer reviewed literature. Yet the authors chose to proceed to transplant this next patient, described in (1). 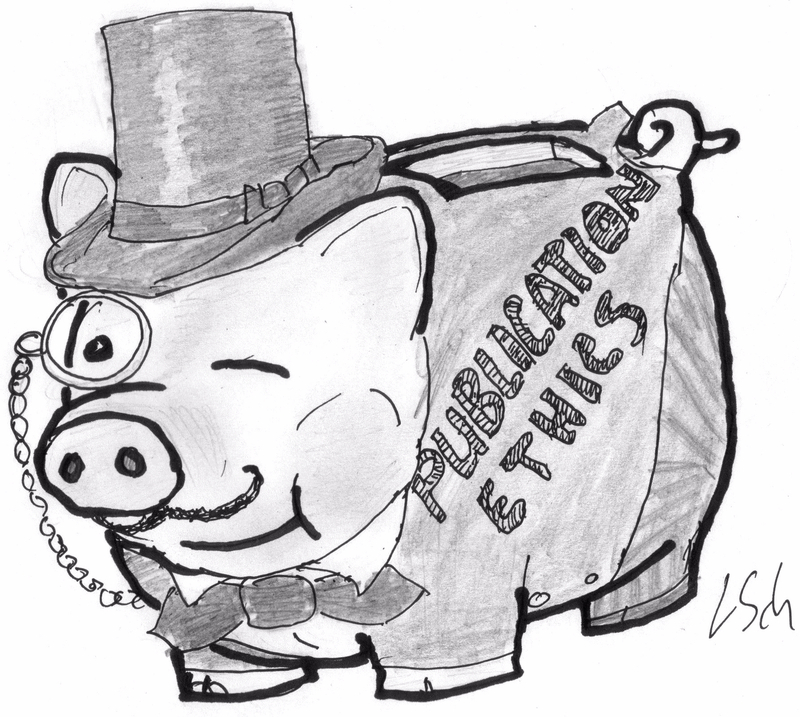 The publication offers no ethics declaration whatsoever. The book (4) indicates in this regard an unspecified institutional investigation in connection to the accusations of breach of medicinal produce law from 22.07.2009. Prof Thorsten Walles was in fact according to this book threatened by the German authorities with withdrawal of his medical license and 3 years of prison (4). I am currently trying to establish the details with the responsible federal authority, the Paul-Ehrich-Institute. The tracheal transplant described here as a patch had been previously repeatedly presented to lay audience differently, namely as a graft of a tubular segment of the trachea, in interviews given by the lead scientists Thorsten and Heike Walles, e.g. (7), institutional press releases, e.g. (8) as well as the 2013 book which describes this operation and its course in detail (4). The lead role of the only corresponding author of the publication (1) is unclear, since Dr. Maria Steinke was never mentioned anywhere before (or in fact even after!) in connection to the 2009 tracheal graft, which was generated in the lab of Prof Heike Walles at the Fraunhofer Institute for Interfacial Engineering and Biotechnology in Stuttgart and transplanted by the surgeon Prof. Thorsten Walles at the nearby Robert Bosch Hospital, Clinic Schillerhöhe. I will now add some details. First of all, according to the statements by Prof Thorsten Walles in interviews (9), his 2015 book chapter (10) and his own court testimony, only three patients were transplanted with tracheal grafts by him in collaboration with Heike Walles so far, the last patient is clearly referenced to the publication discussed here. The clinical patient description given in (1) fits neatly to that of Pavninder Singh, the central figure of the chapter „Atmen“ in the Albrecht book (4). The patient gave his informed approval to lift the medical confidentiality (B. Albrecht, personal communication), which also allowed the book author access to the patient’s medical files. The decision to operate this patient with a pig-intestine-based tracheal graft was apparently made following the performance evaluation of two previous tracheal transplants I describe briefly below. Again, it is not clear if animal testing of such airway grafts were ever performed prior to the third operation in 2009, as no publications by Profs Walles in this regard are available through PubMed. There was apparently an extensive in vitro development of this technology (11), but again without any mention whatsoever of actual in vivo animal experiments. Also the follow-up technology development, after the 2009 operation, apparently did not involve any animal testing, as evidenced by the dissertation of Prof Heike Walles’ PhD student and co-author of (1), Dr. Iris Dally (12). Meanwhile, a federally-funded clinical trial on up to 15 patients was prepared (13). As we all learned for the recent trachea transplant scandals from Sweden (14), extensive animal testing is imperative before any human intervention, to ensure patient safety and research ethics. In fact, the first patient was transplanted by Profs Walles in 2004 with a tracheal patch at the Hannover Medical School in collaboration with none other than the very same scandal surgeon Paolo Macchiarini (14), who was also senior collaborator of Heike Walles (then under name of Heike Mertsching). This is how Thorsten Walles described the development of the pig-intestine-based technology for the tracheal grafts: “I was able to convince my then-boss Paolo Macchiarini of the concept of treating such injuries with bioartificial tissues. Together we modified the procedures for the production of human bioartificial tissues for trachea transplants, originally developed by Prof. Mertsching and myself. Already in 2004 we were able to successfully treat the first patient”. This first patient is described here (15,16), Paolo Macchiarini is the only corresponding author on both publications. This patient died (from apparently unrelated causes) 16 months after the operation (9). That human research paper also mentions no previous animal testing. Unlike that first patient, their second one is mentioned in this discussed publication by Profs Walles, with reference to (5). However, only a biocompatibility test of a tubular tracheal segment in the patient’s arm is described. In his interview (9), Thorsten Walles narrates that that a follow-up operation was performed just one week later, using a parallel bioreactor-generated second tracheal graft, which was then implanted into the patient. The patient however died very soon after this operation, as evidenced by the Albrecht book (4) a press release (6) and Walles own court testimony. In 2009, the patient described in this publication (1) was transplanted with an allegedly fully vascularised tracheal graft (though there is no evidence from any previous animal in vivo testing for this assertion). The patient is described in present tense, though at the time of publication, he was dead for almost 4 years already: „Bronchoscopically and clinically there is a full regeneration of the tracheobronchal defect. The patient is resilient and needs no post-operative care in terms of lung medicine or thoracic surgery”. The publication declares that 2.5 year after the transplant „the patient reported that he could eat and drink normally and was also able to play soccer“. An important point missing is the re-opened tracheostoma. As someone who had been investigating the Macchiarini trachea transplant affair for some time, I understand that such intervention is not minor and is highly relevant to assess the performance of any tracheal graft. Yet the authors chose not to mention it to their peer reviewers or readers. Prof Thorsten Walles apparently closed the tracheostoma himself after the graft was transplanted (4), in his court testimony he insists that it was reopened by a third party, but admits to have been aware of the re-opened tracheostoma until the patients death by sucide in late 2011. Concluding I would like to explain that I tried many times to obtain information about this and the previous trachea transplants from the responsible research institutions, namely the Fraunhofer Society and the University of Würzburg. My inquiries were categorically denied, as well as my request to investigate the inconsistencies in the publications by Profs Walles which I describe above. Instead of replying my questions, Profs Walles initiated a legal action against my reporting, where a injunction was passed by the regional court in Würzburg in my absence and without my prior knowledge (3). According to the court decision, I am never to again to mention on my site: the previous involvement of Paolo Macchiarini in the development of the pig-intestine based tracheal graft technology, the tracheostoma of the patient Pavninder Singh or the deaths of this and the previous trachea transplant patients of Profs Walles. I will be appealing this injunction soon. Albrecht B. Patient meines Lebens: Von Ärzten, die alles wagen. Droemer HC; 2013. Walles T. 2.4 Was gibt es Neues beim Tissue Engineering und Trachealersatz? Was Gibt Es Neues Chir. 2015th ed. ecomed Medizin; 2015. “These results confirm our previous report in another patient 6 months after airway reconstruction that the tissue-engineered transplant facilitates the complete regeneration of the airway defect”. Soon however, my letter to editor was rejected. Here is the decision, together with peer reviews. The Reviewer Nr 3, as usual, takes the biscuit. Thank you for submitting your Letter to the Editor to us for review. I am afraid it is not suitable for publication in Tissue Engineering Part A. We appreciate you bringing these issues to the attention of the Journal. Your website more than covers the issues you describe in your letter. Comments of the reviewer(s) are included at the bottom of this letter. My impression is that this is a dispute between the letter writer and paper author. The letter suggests that details about the patient care were omitted in the article such as a re-opening procedure after the initial surgery and that the patient apparently committed suicide. It also suggests inconsistencies in information given at conferences compared to that in the paper. Although I did not try to track down the referenced information provided in the letter, these allegations would be difficult to confirm and don’t seem to impact the conclusions made in the paper. The letter also suggests that the surgical procedure was done without prior animal testing. Whether this is allowed or not in an individual country is a regulatory issue. There are no suggestions in letter that data were falsified or improperly analyzed. The letter suggests a disagreement with the conclusion that the procedure was successful but does not give specific reasons why other than the issues noted above. I also note that the letter author does not seem to request that his letter be published. It seems instead to simply be intended to make the journal aware. My suggestion would be not publishing it. The letter by Schneider draws possible inconsistencies in the manuscript published in Tssue Engineering 21(3). Conceptually this letter does have merit in being published if the tone is more definitive and factual. – The tone of the letter needs to be less personalised and focus on the issue in hand. – References in the letter to the interaction with the authors does not add to the inconsistences hence the reviewer suggest removing these references from the letter (e.g. corresspondence with the author in bullet 1 on paage1). – The letter refers to legal cases which are difficult to substantiate in this review process by the journal’s reviewers or the editors—hence best not to include these references. Suggest to redraft the letter by summarising the factual data that is in the public domain and including the missing data that the Tissue Engineering manuscript did not elaborate. In addition the authors attempts to gather information on this case from the authors is also not appropriate for the letter format in this journal. I do not think readers, or journal, would benefit from this letter, and would not recommend publishing it. Here are some of the reasons. Of course, it is a good practice to publish letters that raise questions about published work, and then also give the authors an opportunity to respond. Such letters are usually a result of experimental work and inability to reproduce the data. In this case, the letter is about an article published in 2015 (and apparently completed in 2011), and is a part of a web-based campaign against the authors’ line of research (Heike and Thorsten Walles) that seems now to also involve lawyers. Clearly, the context is even broader and relates to questions asked in recent years about the method pioneered by Machiarini that initially looked very promising but then resulted in serious clinical issues. Dr Schneider has 6 publications, some of which in recent years, but his main activity seems to be writing on a website “For better science” where he discusses cases of (un)ethical conduct of research, and various cases of scientific controversies. Dr Schneider recently posted on his website the texts entitled “Untangling forgotten tracheal transplants of Heike and Thorsten Walles, who set a lawyer upon me” (reference ) and “Bavarian court sentences me to prison if I dare repeat unwelcome facts of Walles’ trachea transplants” (reference ). There is hardly any new information in the manuscript that is not contained in these texts. I believe that this by itself should be a reason for rejecting the publication of this letter. Some of the potentially valid points raised in the manuscript include: (1) No mention of the tracheostomy that was reportedly re-opened shortly after the operation, (2) Lack of mention of any animal studies conducted before the human trial, and (3) Lack of detailed reference to prior human studies that were (reportedly) not successful. Under different circumstances, it would be valid and appropriate to ask the authors to address these questions, by giving them opportunity to respond to a “letter to Editor”. However, here we have a letter not based on new scientific findings, and the letter is largely based on web postings (7 out of 16 references), the book by Albrecht (reference ), and court testimonies. Another troublesome point is that Dr Schneider states in his letter that “The clinical patient description given in (1) fits neatly to that of Pavninder Singh, the central figure of the chapter „Atmen“ in the Albrecht book (4).” And: “The patient gave his informed approval to lift the medical confidentiality (B. Albrecht, personal communication), which also allowed the book author access to the patient’s medical files.” Even if this information, based on personal communication with Mr Albrecht, is accurate, this is not the way to disclose and discuss the patient’s identity to the broad audience. In summary, I would recommend rejection of this letter based on the lack of new information, not disclosed before, in print or on web. If you would like to support my ongoing court defence against Walles’ accusations financially, donation amount doesn’t matter, please go to my Patreon site or contact me. Any idea of the date when Sabine Kleinert told this to Pierre Delaere? Any idea if the message of Sabine Kleinert lists a definition of ‘scientific misconduct’? Sabine Kleinert has currently a side-job at COPE. Source: http://publicationethics.org/about/cope-alumni : “COPE has benefited from many experienced editors and other publishing professionals who have served on its council, and as officers. The group below lists some previous council members who have agreed on occasion to continue to represent and speak on behalf of COPE. (…). Sabine Kleinert Vice-chair (2006 – 2012), Council member (2001 – 2006)”. It is not indicated at http://www.thelancet.com/lancet-people that Sabine Kleinert has this side-job at COPE. https://forbetterscience.com/2015/10/31/join-the-committee-ignore-publication-ethics/#comment-353 (added with additional information about #7). Ah yes, the good old medical ethics principle of “First do no harm, unless it’s a regulatory issue in your individual country, in which case it’s fine”. Have you been following the recent reports at PubPeer, documenting data fabrication and image recycling in the Walles-Mertsching publications? I doubt that the operation on Patient No.3 was fully legal, which does not necessarily mean that it is punishable to a significant level. However, lack of full legality, plus the emerging non-serious attitude towards science and to reporting of results, plus the fact that there is a realistic chance that the transplant did do damage, may allow the widow of the patient to sue for damages (depending on the country laws). The overall problem with the case is that we can’t know whether the transplant failed or succeeded because the relevant investigations appear not to have been done. The Walleses believe that it succeeded because 2.5 years after the operation the transplant spot of the trachea had healed, but there are no indications that they know what happened during those 2.5 years. At the 2.5 year time point they probably only found self-tissue (“we assume that it is completely replaced by host tissue”), and it is unclear whether the road towards that situation was rocky or smooth, and whether the recovery was aided or impeded by the transplant type. Leonid believes that it failed, although his information is also only indirect, and includes the facts that the tracheostomy had to be reintroduced, that the patient continued to suffer from throat problems, and that the type of transplant was apparently considered too toxic for experiments in big animals. Regardless whether Leonid was fully correct in his writing style or not, it is ridiculous that this discussion has to be fought out in court. It raises the suspicion that the Walleses feel more secure about proving that Leonid is wrong than about proving that they themselves are right. Whether that strategy will work remains to be seen, because the lawsuit states that it is importantly based on the declarations under oath by the plaintiffs, and these declarations claim an absence of immune rejection (which in my opinion the Walleses can’t know). Curious is that at the very least the case seems not to have the simplicity required for preliminary injunctions, which you can also take from the answers of the three reviewers.